Catherine Rogers is an artist from Portland, OR who is now a Charleston resident selling art at the Night Market in the City Market downtown Charleston. This woodblock 8 X 10 print is modeled from a picture taken at White Point Gardens in dowtown Cha.. 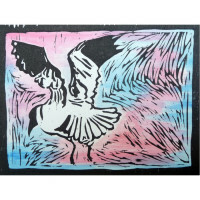 This piece is a 8X10in woodcut print on top of a watercolor background. Available in custom c..